You know, I have one simple request. And that is to have Humvees with frickin' laser beams attached to their roofs! The US Army is already developing them? Oh well, that's a start. The HLONS (HMMWV Laser Ordnance Neutralization System), better known as the ZEUS system, consists of a solid-state "directed-energy weapon" (aka a laser) mounted on the roof of a Humvee. Its 10 kW solid-state heat capacity (SSHC) laser is capable of remotely detonating IED's, surface mines, and UXO's (UneXploded Ordnances) from up to 300 meters away by heating the target's explosive filler to the point of ignition. Unlike current methods of bomb disposal, which rely on Hurt Locker-style EOD teams, the ZEUS destroys ordinances regardless of how they're wired. ZEUS only requires a clear line of sight to the explosives and can be fired as many as 2,000 times a day. It takes about 30 seconds, on average, for detonation to occur. 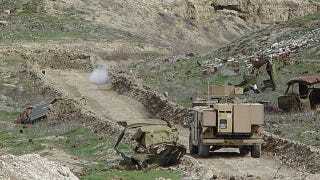 The system also has the advantage of keeping EOD teams safely in the Humvee—out of the way of sniper fire. ZEUS has been under development since 1996 at the Army's High Energy Laser Systems Test Facility (HELSTF) in White Sands Missile Range, New Mexico. By 2003, the system was reliable and mobile enough to qualify for field tests in Afghanistan during Operation Enduring Freedom. During its 6-month tour of duty, ZEUS cleared more than 200 munitions—though, to be fair, 51 of those were neutralized in a 100 minute period. On average, the ZEUS can clear about 24 IED's in the course of an hour. In 2005, ZEUS was deployed to Iraq, distinguishing it as the first battlefield use of a laser weapon.